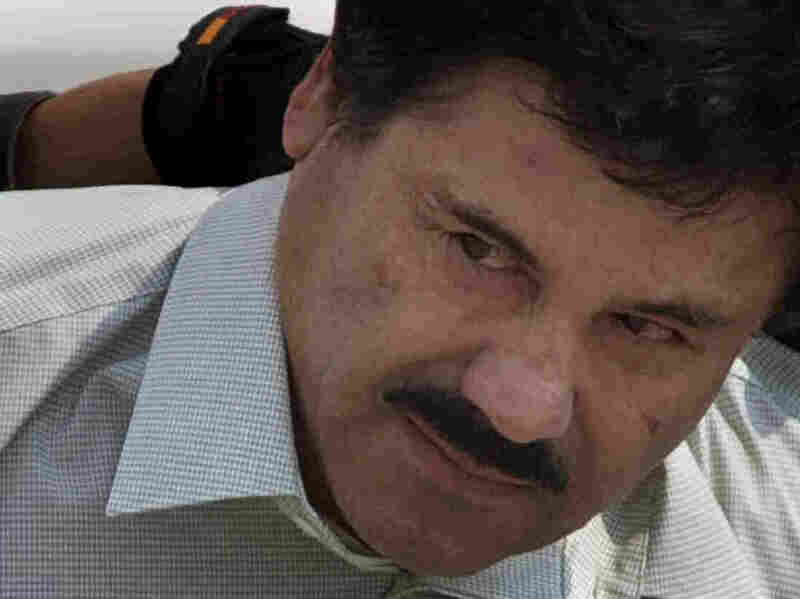 'El Chapo' Guzmán Escapes From Authorities, But Suffers Injuries : The Two-Way Joaquín Guzmán became Mexico's most wanted drug trafficker after he escaped from a maximum-security prison. Authorities said they had found Guzmán but he escaped again. Joaquin "El Chapo" Guzman is escorted to a helicopter in handcuffs by Mexican navy marines at a navy hanger in Mexico City after his capture last year. Guzman escaped from a maximum security prison for the second time this July; today, Mexican authorities announced he evaded an attempt to recapture him. Joaquín "El Chapo" Guzmán has once again eluded Mexican authorities. This time, reports NPR's Carrie Kahn, Mexican marines had found Mexico's most wanted drug trafficker in a remote mountainous area, but he got away again, suffering injuries. "Mexican officials say marines had found a hideout used by Guzmán in the mountains between Durango and Sinaloa states, but were unable to capture the drug kingpin. In his escape, and not a result of a direct confrontation, Guzmán sustained injuries to his face and one leg, according to officials. "Mexico's National Security agencies acknowledged the failed attempt, after several news outlets reported the operation. State officials in Durango also confirmed the troop movement and that more than 200 families had fled the region out of fear. "Guzmán escaped from Mexico's maximum security prison last July through a sophisticated custom-built tunnel. He was thought to be hiding out in the rugged Sierra Mountains near his home state of Sinaloa and solid base of support." This news comes just days after a Mexican television station aired surveillance video of his escape that included audio. Shortly after his escape, authorities released silent video of his jail cell. On the video broadcast by Televisa, a loud noise — perhaps a chipping hammer — could be heard over the sound of Guzmán's television. At another point, a huge crash that sounds like falling concrete or debris is heard. El Universal reports that authorities have since said that the guards on duty that night did not have access to the audio from the surveillance video. The video broadcast by Televisa also shows that it took prison guards about 40 minutes to come into Guzmán's cell after his escape.